Four RED color anodized potentiometer knobs for use with amplifiers, preamps, electric guitars, radios and other devices that have 6.0 mm diameter potentiometer shafts. The knobs have a knurled finish around their circumference. The knobs do not have a plastic insert; they are CNC machined from one piece of solid aluminum and have a durable red-color anodized surface finish. Dimensions: 25 mm diameter, 15.5 mm height, 6.0 mm shaft hole diameter. *****PLEASE NOTE: These knobs will only fit European/Asian manufactured potentiometers with a nominal 6.0 mm shaft diameter. ***** The shaft hole depth is 14 mm (this depth includes the 10.5 mm drilled depth and a 3.5 mm machined recess on the backside of knob - see photos). NOTE...Sorry but these knobs WILL NOT FIT inch (6.35 mm) diameter potentiometer shafts. ***** Please...Accurately measure the potentiometer shaft diameter and length with calipers or a micrometer before placing an order. These knobs will not fit 1/4 inch shafts - that small 0.35 mm difference in diameter between European/Asian and most US manufactured potentiometer shafts is very unforgiving when it comes to metal knobs! Each knob is secured to the shaft with a single setscrew (setscrews and a 2 mm hex wrench are included with the knobs). 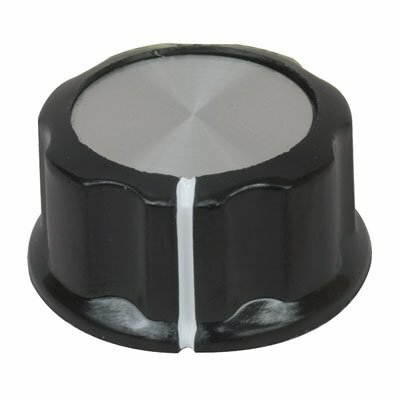 If you only need two knobs or identical knobs for a different shaft diameter please click on our storefront "Riverstone Audio" at the top of this page to view more products. Four high-quality anodized potentiometer knobs - solid aluminum - CNC machined. RED COLOR: 25 mm diameter x 15.5 mm height. Fit 6 mm shaft. We are perfectionists when it comes to audio products. ALL knobs sold by Riverstone Audio are meticulously inspected to ensure they are free of scratches and surface defects and packed in foam-lined boxes to keep them safe during shipping. Please Note: The color of anodized surfaces can vary slightly with different light sources (LED, CFL, incandescent or natural light) and viewing angle. The pictures of the knobs were taken in natural light. For an artificial light source, the color may vary with the CRI (color rendering index) of the light source. The interaction of quality anodized surfaces with light source and viewing angle is one of the beauties of anodized surfaces and why our knobs are anodized, not painted. Knobs are machined for a 6.0 mm shaft diameter - not suitable for use with 1/4 inch (6.35 mm) diameter shafts. 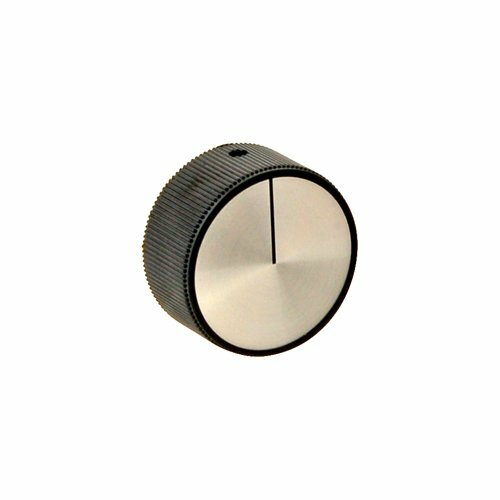 Please see our Amazon Storefront for knobs that fit other shaft diameters or if your application requires only 2 knobs (with the identical color). To order please click on the ASIN number adjacent to the desired color in the product table above. Globe M00222 Knife Cover Release Knob. 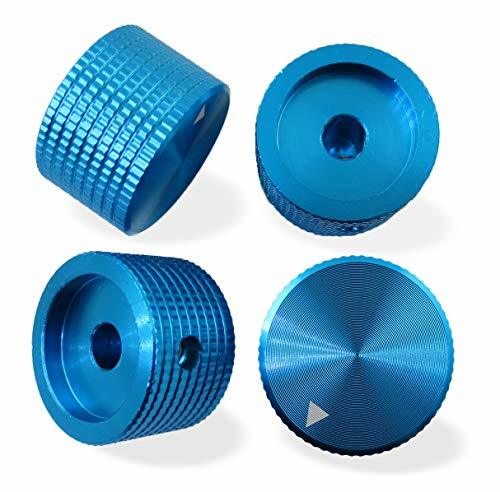 Four BLUE color anodized potentiometer knobs for use with amplifiers, preamps, electric guitars, radios and other devices that have 6.0 mm diameter potentiometer shafts. The knobs have a knurled finish around their circumference. The knobs do not have a plastic insert; they are CNC machined from one piece of solid aluminum and have a durable red-color anodized surface finish. 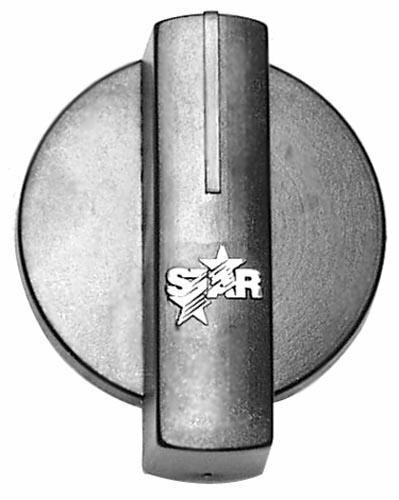 Dimensions: 25 mm diameter, 15.5 mm height, 6.0 mm shaft hole diameter. *****PLEASE NOTE: These knobs will only fit European/Asian manufactured potentiometers with a nominal 6.0 mm shaft diameter. ***** The shaft hole depth is 14 mm (this depth includes the 10.5 mm drilled depth and a 3.5 mm machined recess on the backside of knob - see photos). NOTE...Sorry but these knobs WILL NOT FIT inch (6.35 mm) diameter potentiometer shafts. ***** Please...Accurately measure the potentiometer shaft diameter and length with calipers or a micrometer before placing an order. These knobs will not fit 1/4 inch shafts - that small 0.35 mm difference in diameter between European/Asian and most US manufactured potentiometer shafts is very unforgiving when it comes to metal knobs! Each knob is secured to the shaft with a single setscrew (setscrews and a 2 mm hex wrench are included with the knobs). If you only require two knobs or identical color knobs for a different shaft diameter please click on our storefront "Riverstone Audio" at the top of this page to view more products. 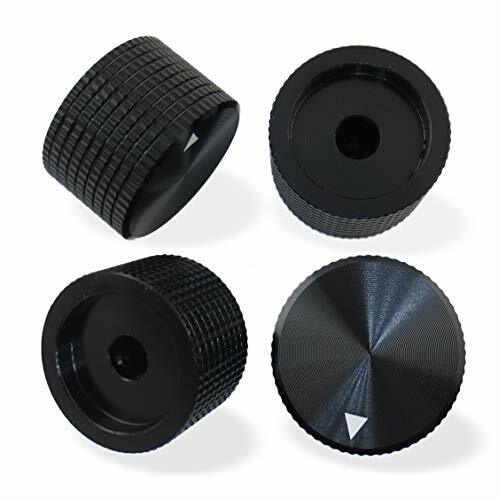 Four high-quality anodized potentiometer knobs - solid aluminum - CNC machined. BLUE color: 25 mm diameter x 15.5 mm height. Fit 6 mm shaft. r />615(M,MA), 624(M,MA), 636(M,MA,MB), 648(M,MA). 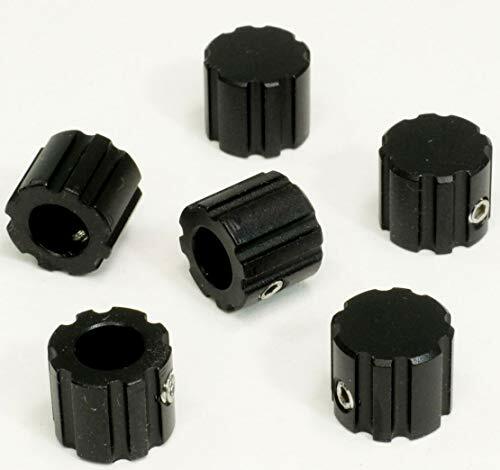 Four BLACK color anodized potentiometer knobs for use with amplifiers, preamps, electric guitars, radios and other devices that have 6.0 mm diameter potentiometer shafts. The knobs have a knurled finish around their circumference. 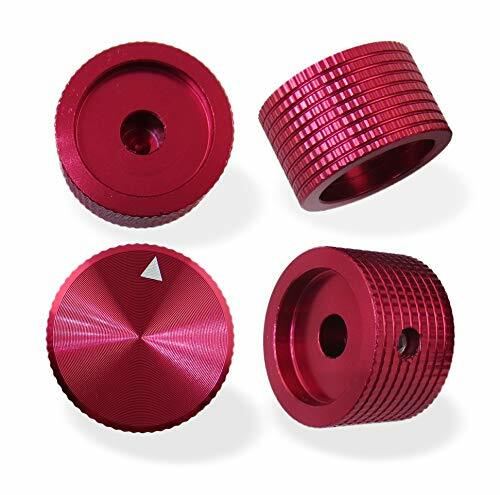 The knobs do not have a plastic insert; they are CNC machined from one piece of solid aluminum and have a durable red-color anodized surface finish. 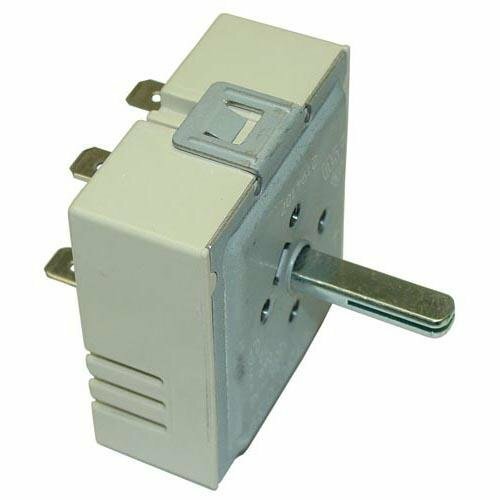 Dimensions: 25 mm diameter, 15.5 mm height, 6.0 mm shaft hole diameter. *****PLEASE NOTE: These knobs will only fit European/Asian manufactured potentiometers with a nominal 6.0 mm shaft diameter. ***** The shaft hole depth is 14 mm (this depth includes the 10.5 mm drilled depth and a 3.5 mm machined recess on the backside of knob - see photos). NOTE...Sorry but these knobs WILL NOT FIT inch (6.35 mm) diameter potentiometer shafts. ***** Please...Accurately measure the potentiometer shaft diameter and length with calipers or a micrometer before placing an order. These knobs will not fit 1/4 inch shafts - that small 0.35 mm difference in diameter between European/Asian and most US manufactured potentiometer shafts is very unforgiving when it comes to metal knobs! Each knob is secured to the shaft with a single setscrew (setscrews and a 2 mm hex wrench are included with the knobs). If you require only two knobs with the same color please click on our storefront "Riverstone Audio" at the top of this page to view more products. Four high-quality anodized potentiometer knobs - solid aluminum - CNC machined. BLACK color: 25 mm diameter x 15.5 mm height. Fit 6 mm shaft. Knobs are machined for a 6.0 mm shaft diameter - not suitable for use with 1/4 inch (6.35 mm) diameter shafts. 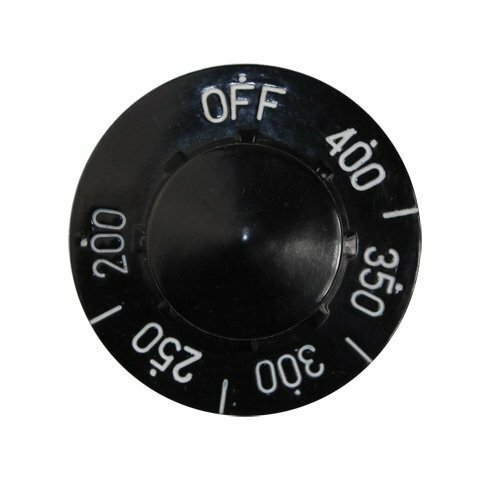 Please see our Amazon Storefront for knobs that fit other shaft diameters or if your application requires only 2 knobs. 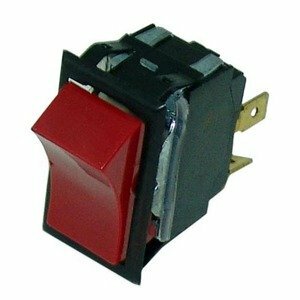 Four RED color anodized potentiometer knobs for use with amplifiers, preamps, electric guitars, radios and other devices that have 1/4 inch diameter potentiometer shafts. The knobs have a knurled finish around their circumference. 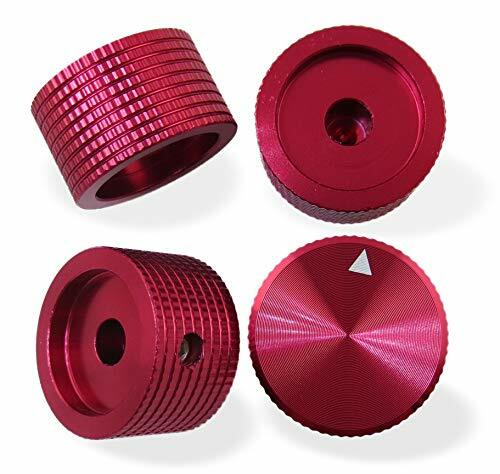 The knobs do not have a plastic insert; they are CNC machined from one piece of solid aluminum and have a durable red-color anodized surface finish. Dimensions: 25 mm diameter, 15.5 mm height, 1/4 (0.25) inch shaft hole diameter. 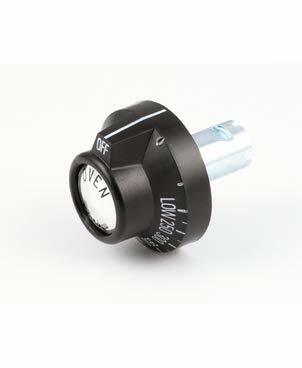 *****PLEASE NOTE: These knobs will only fit US manufactured potentiometers with a nominal 1/4 inch shaft diameter. ***** The shaft hole depth is 14 mm (this depth includes the 10.5 mm drilled depth and a 3.5 mm machined recess on the backside of knob - see photos). NOTE...Sorry but these knobs WILL NOT FIT European/Asian potentiometers with 6 mm diameter shafts. *****Please...Accurately measure the potentiometer shaft diameter and length with calipers or a micrometer before placing an order. Each knob is secured to the shaft with a single setscrew (setscrews and a 2 mm hex wrench are included with the knobs). If you require knobs for 6 mm shafts or only two knobs with the same color please click on our storefront "Riverstone Audio" at the top of this page to view more products. Four knobs - RED - high-quality anodized potentiometer knobs - solid aluminum - CNC machined. RED color: 25 mm diameter x 15.5 mm height. Fit 1/4 inch diameter shafts. 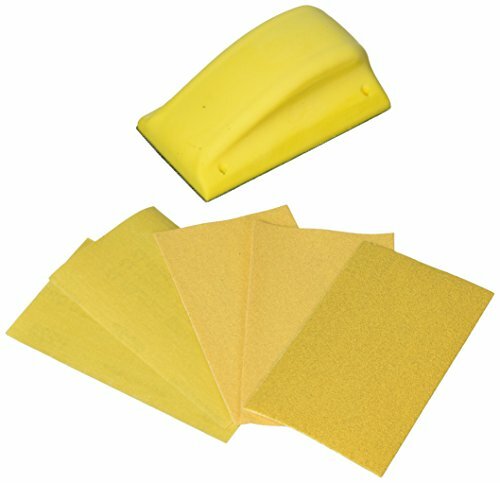 The detail sander is perfect for getting into small, hard-to-reach areas, while the finishing block sander akes general hand sanding quick and comfortable. 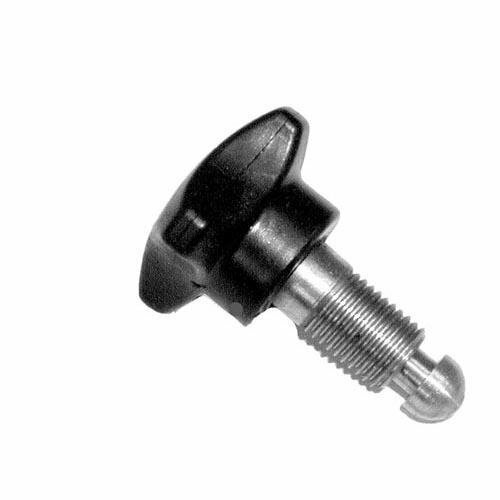 Jameco Valuepro JK-901B Knob, 1/4" Shaft, Black/Aluminum with Set Screw (Pack of 4). 1/4 inch. Whistle pointer. Black/aluminum. 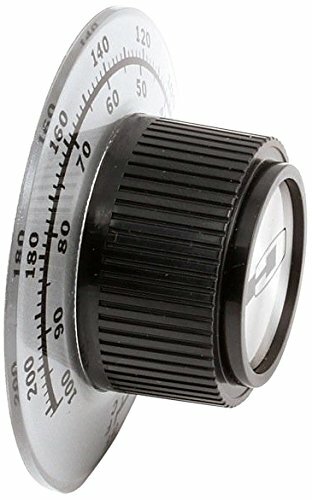 Jameco Valuepro JK-901B Knob, 1/4" Shaft, Black/Aluminum with Set Screw (Pack of 4). Unit Count : Knob. 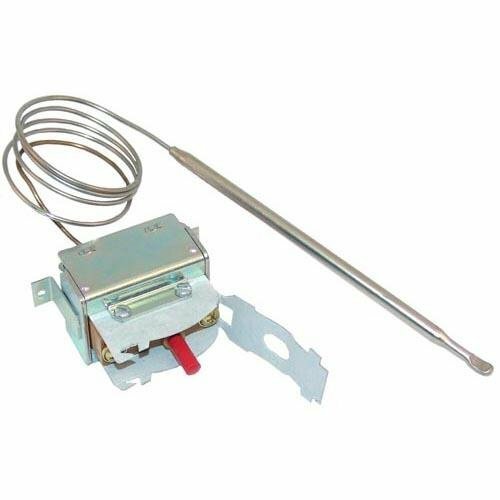 Henny Penny 25863 Thermostat Knob.